Can Apple TV 4 play MKV files? How to play MKV on Apple TV 4? If you want to play MKV videos on Apple TV 4 smoothly, you’d better read this article and we will share the best way to play MKV on Apple TV 4, and you will also get the best Apple TV 4 video converter, which can convert Blu-ray, DVD, MKV, AVI, WMV, MOV, MP4, etc. to Apple TV 4 supported format. Apple TV 4 is very popular on the market, more and more people buy Apple TV 4 to connect to HDTV for watching videos and movies, compared to the last version the new Apple TV 4 has many new features, it is definitely worth the money. As more and more users get the Apple TV 4, there are many Apple TV 4 related questions asked on the forums and websites, one of the hot topics is the MKV playback on Apple TV 4. A lot of users have MKV videos and movies stored on computer, and now they want to play MKV on Apple TV 4 so that they can enjoy the videos and movies on big HDTV. But when they tried to play MKV on Apple TV 4 they get failure, the Apple TV 4 can’t play MKV videos, what’s the reason? The MKV to Apple TV 4 playback issue is caused by the video format limitation of Apple TV 4. If you check Apple TV 4 user manual or its product page you will learn that Apple TV 4 supported video formats are limited, it can only play H.264/MPEG-4 MOV, MP4 and M4V files, for other video formats like MKV, AVI, WMV, etc. Apple TV 4 is not able to play them, so you can’t play MKV on Apple TV 4 direct. How to play MKV on Apple TV 4? As we talked above, the Apple TV 4 can’t play MKV files directly, in this case how can we play MKV on Apple TV 4? The best way is to convert MKV files to Apple TV 4 supported video formats like MOV, MP4 and M4V, and then you can play MKV on Apple TV 4 with compatible format. 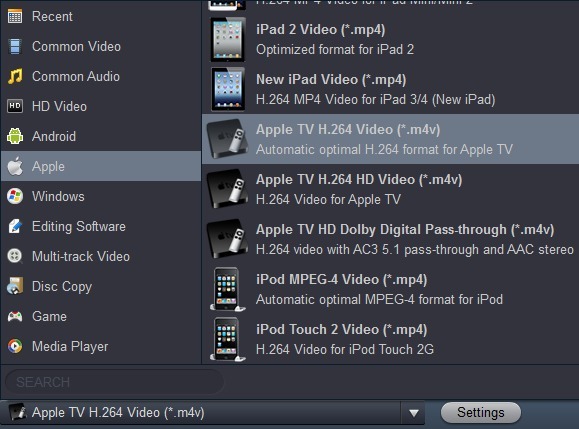 In order to convert MKV to Apple TV 4 compatible format, we want to introduce the best MKV to Apple TV 4 converter for you, the software is Acrok Video Converter Ultimate, this powerful software can help you to convert MKV, AVI, WMV, FLV, DVD or Blu-ray to Apple TV 4 supported formats, and then you won’t have video playback problems with Apple TV 4. Now you can get this MKV to Apple TV 4 converter from the link below. Step 1. Download Acrok Video Converter Ultimate, install this software on your computer, this software has Windows version and Mac version, so it will help you to convert MKV to Apple TV 4 on Mac and Windows 10/8.1/7. Step 2. Launch this Apple TV 4 MKV converter you will see the main interface, click “Add Files” button to import the MKV files at you want to convert, you can also load other HD videos like AVI, WMV, FLV, MTS, VOB, MPG, etc. into it for converting. 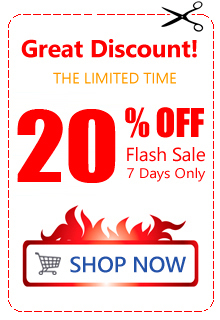 Besides, Acrok software can also rip latest Blu-ray and DVD movies to any unprotected common videos, and then you can copy Blu-ray or DVD movies to any devices for playing. Step 3. After you loaded the videos, please select output format you want, there are rich output formats in this MKV to Apple TV 4 converter, you can choose it according to your need. For example, you can choose HD Video -> Apple TV H.264 Video or Apple TV HD Dolby Digital Pass-through, they are well supported by Apple TV 4. Step 4. Before converting MKV files to Apple TV 4, you can click Settings button on the main interface to adjust the output parameters, for example, you can change the resolution to 1280*720 (720p) or 1920*1080 (1080p), and then you will get 720p or 1080p videos. Step 5. Click convert button, MKV to Apple TV 4 conversion process will begin immediately. Please wait some time, Acrok Video Converter Ultimate will convert MKV to Apple TV 4 supported format at top speed and quality, NVIDIA CUDA and AMD APP acceleration technology is supported, so it can convert your videos at faster speed. When your videos are converted to Apple TV 4 compatible format, click open button to get the converted videos, and then you can play these videos through Apple TV 4 on your HDTV, there will be no problems anymore. Acrok Video Converter Ultimate is the best video converter program I have used, after got this powerful converter I can easily convert MKV files to Apple TV 4 and iPad Pro supported format, the quality is good and the conversion speed is fast, it’s awesome! 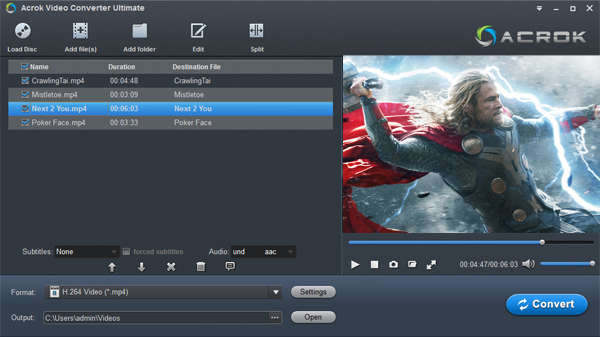 With the help of this program I can easily play my videos on any playable devices without problems.